AnkhSVN is a small yet powerful application which offers Apache Subversion support for source code handling to all types of projects supported by MS Visual Studio. 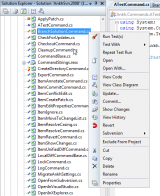 The application lets you perform a wide range of version control tasks directly from within your MS Visual Studio IDE (Integrated Development Environment). AnkhSVN includes a Pending Changes dashboard which offers you an advanced overview of your development process and allows you to easily access the issue management functions and your application's source code. The program also offers seamless SCC (Source Code Control) integration, allowing you to better concentrate on your development tasks. AnkhSVN helps you monitor all changes made to your code and offers all the tools you need to handle your source code in a simple and efficient way. Offers a rich set of powerful tools. Allows you to easily handle and manage your source code. Requires some coding knowledge and skills. The program is not aimed at average users.